The former star quarterback was released Monday after a tumultuous few years with the team. The following information is provided by Graphiq and pointafter. 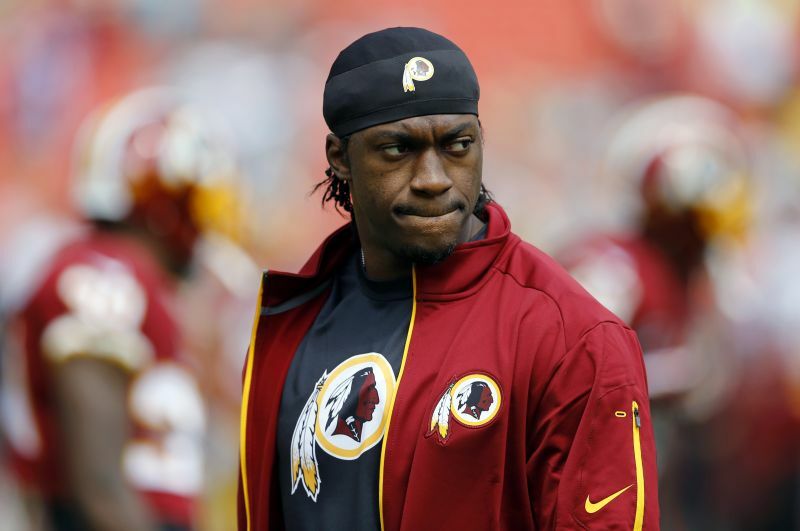 Robert Griffin III was meant to be the savior of a decrepit Washington Redskins franchise. Washington’s brass traded three first-round picks and one second-round pick in order to move up in the 2012 NFL Draft to land RGIII. Fast-forward to 2016 (with a QB record of 14-21), and Griffin has been released, per NFL.com’s Ian Rapoport. It was a swift fall from grace for the former Heisman Trophy winner following an extremely promising rookie season. Throughout his first season as a pro, the Baylor product threw for 3,200 yards and 20 touchdowns against just five interceptions. He rushed for an additional 815 yards and seven touchdowns on the ground, proving himself as a bona fide dual-threat QB. He won AP Offensive Rookie of the Year and made the 2012 Pro Bowl for his efforts. From there, however, RGIII’s touchdown and interception percentages gradually trended in opposite directions. You can’t discuss the young quarterback’s time in D.C. without mentioning his injuries. It’s not unreasonable to say Griffin could have adapted in the nation’s capital had his knees not been cut out from under him multiple times near the end of his rookie year. He suffered a knee injury in December 2012 after taking a hit from Haloti Ngata of the Baltimore Ravens. Griffin re-entered the game after taking the violent hit to his right leg, but was replaced by backup Kirk Cousins once it became clear RGIII had issues putting weight on the leg. He missed Week 15 after being diagnosed with a mild LCL sprain, but was put back under center for Week 16 and for Washington’s playoff game against the Seattle Seahawks — decisions by head coach Mike Shanahan that drew ire from pundits and fans. Griffin’s injured right knee, encumbered by a bulky black brace, buckled as he tried to recover a bungled snap during the Jan. 6, 2013, postseason affair against Seattle. The promising quarterback suffered a torn LCL and ACL, requiring reconstructive surgery. Griffin has never been the same following the injury, and was ultimately replaced by Cousins for the starting job. The former fourth-round pick has posted numbers slightly superior to Griffin’s from a passing perspective in the early stages of his career. As Griffin enters free agency, the question now will be where he winds up. One potential destination could be back in Texas. The Houston Texans relied upon a hodgepodge of quarterbacks including Brian Hoyer, Ryan Mallett, T.J. Yates and Brandon Weeden a season ago. Assuming Griffin can return to his past form (or close to it), he could lock down the franchise QB spot for a team that’s already sound at a lot of other positions. If the Texans aren’t interested, keep an eye on the San Francisco 49ers (where Colin Kaepernick has reportedly requested a trade) or the Los Angeles Rams. The latter relied upon Nick Foles as the starter for much of last season — who graded out 36th out of 37 NFL quarterbacks, according to ProFootballFocus (subscription required). With a change of scenery, perhaps RGIII can regain the rookie year magic that dazzled fans. Regardless, Washington’s decision to give up so much for Griffin via trade was ultimately met with disaster.